We have gone over the dogmas of the Roman Catholic Church, witnessed its political and religious power throughout the ages and have examined the duality of such power in ancient Babylon as well. We now shall continue examining this duality within the political and religious spheres of power in the developing destiny of the one world order that will serve the coming one world leader, known as the Beast or more commonly, the anti-Christ. What’s interesting is that in the vision of the Apostle John, it’s the Woman, this False, Global Religious System that seems to be in charge of the Political System of ‘the Beast’ just as we saw at the very beginning with Nimrod and Semiramis where the religion of Babel was the real power, governing the political system. Do we see this same concept for today’s agenda in establishing a one world government? Yes we do! H.G. Wells, famous 19th century novelist (War of the Worlds, The Invisible Man and others) also wrote non-fiction books with titles such as The New World Order; The Open Conspiracy: Blueprints for a World Revolution, and others). Wells was a Fabian Socialist whose secret organization was determined to establish a one world government. "The political world of the... Open Conspiracy must weaken, efface, incorporate and supersede existing governments... The Open Conspiracy is the natural inheritor of socialist and communist enthusiasms; it may be in control of Moscow before it is in control of New York... The character of the Open Conspiracy will now be plainly displayed... It will be a world religion." Wells understood that a belief in a one world government would have to be religious in nature, there would have to be a coming one world religion. All the religions of the world would have to begin to dialogue, to work together, to pray together, and to form a unity that will eventually merge into a single religion of the world, for the world. Do we see any of this happening? Yes, we do! 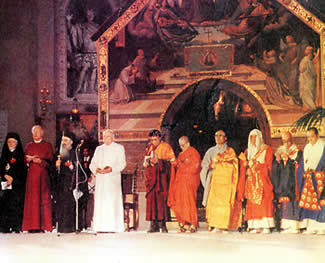 It’s called ECUMENISM – a movement that promotes unity among world religions. 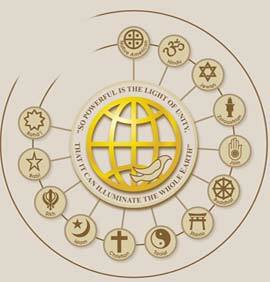 o World Council of Churches (An Ecumenical group sponsored largely by the Roman Catholic Church). • Hinduism, Sikhism, Buddhism, Judaism, Islam, African and North American animists, Shintoism, Zoroastrianism, Baha’I and some others. “In 1993, (as in 1986) John Paul II repeated the Day of Prayer …and invited leaders of the Christian, Muslim and Jewish religions. The Spirituality of the UNITED NATIONS? If you understand anything about the United Nations, then you must also understand its religious/ spiritual perspective and objectives, even in its founding, for a global unity among all religions, and even the formation of a one world religion; based upon the perspectives of Alice Bailey, a leader in the Theosophical Society. Robert Muller, the former Under Secretary for the U.N. was an avid reader of Alice Bailey and had Occult beliefs himself; he also incorporated much of Alice Bailey’s teachings in his own WORLD CORE CURRICULUM which is the basis for our current Public School System here in America! The church of Jesus Christ as being useful in establishing a one world government and religion, but not in its present form. The church would have to be changed from within in order to serve the purpose of the one world order which will serve and worship the coming one (false Christ “Lord Matreiya” known in Scripture as the Beast, the anti-Christ) when he arrives. She was the founder of what we know as the NEW AGE MOVEMENT, and many of her organizations (such as LUCIS TRUST; formerly known as the LUCIFER PUBLISHING Company! ), are sponsored and funded by the U.N. which itself receives considerable funding from U.S. tax dollars; the U.N. is working to establish a world tax where every nation will be forced to pay money to fund its purposes. Do we see the church of Jesus Christ being changed from what the LORD JESUS intended into something different, even opposing Scripture? Yes, we do! Again, there isn’t enough time to go into everything that the Emergent Church teaches and represents either, so we will have to highlight some crucial points. If you want to know more about this movement, its origins and beliefs, I recommend you read the following book by Roger Oakland: FAITH UNDONE. You can also view his material on youtube just by clicking on this link. Lighthouse Trails ministries (go to the left hand side bar and find the “emergent church” button and click). What does the Emergent Church Movement believe? Not all members and followers of this movement believe the same things, or believe the same things to the same degree. Some followers are only dabbling in Emergent dogma, others are entirely devoted to them. Breaking it down as simply as possible, they see the Bible as inspired of God but only in a very broad, general sense, and that God’s Word continues to be revealed in the telling of stories today in the same way that stories were shared by the writers of the Bible and in shared spiritual experiences. They question the idea of absolute truth and renounce any that believe they possess the absolute truth as revealed in the Scriptures as being arrogant, biased, and unlearned. Basically they have a low view of the Bible. Emergent Followers also place a high priority on experiential spirituality that involve mystical practices (we’ll address this soon) and like the idea of placing in their meeting rooms or sanctuaries such things as candles, incense, statues (icons), making the sign of the cross over themselves, low light environment, even stations of the Cross; some place meditation labyrinths just outside of their buildings for people to walk through. They have a desire for a more sensual religious experience rather than teachings from the Word of God. Some Emergent followers express not just an interest in but a certain devotion to Mary, the ‘Mother of God’. For a video on this, please watch this presentation on youtube MESSAGES FROM HEAVEN (1 hr. 27 mins). You will see in this documentary how visions of Mary appearing all over the world are persuading people to believe in her and in the coming new world order. This documentary states that more visions of Mary have appeared in the 20th century than the previous three centuries combined! At the same time, one Emergent Church leader in a radio interview, Brian McLaren, went on record as saying that he would place Jesus on the same high level as Martin Luther King or Gandhi! So they have a lower view of Jesus, calling Him: Master, Teacher, Leader, even ‘Coach’ but seldom or never as LORD or GOD made flesh. They talk about “the way of Jesus” but not Jesus as “THE Way, THE Truth, and THE Life” by Him alone we come to the Father (John 14:6) and believe he is a good role model that anyone can follow (without being born again; John 3:3, 5), even people of other religions and not convert to Christianity. Also, the reading of very old books written by authors like Thomas A. Kempis, Meister Eckhart, Teresa of Avila, John of the Cross, Thomas Aquinas and other more modern authors like Thomas Merton, Brennan Manning, Henri Nouwen, Richard Foster, Gary Thomas and others. With the exception of the last two names, all the rest are Catholics and they all are practitioners of mysticism. Incidentally, Rick Warren, author of The Purpose Driven Life and The Purpose Driven Church endorses many of these writers and encourages something he calls “breathe prayers” which is related to mystical meditation. The Emergent Church talks about how we have lost vital spirituality and have become dry and barren, basing our faith solely on the writings of an old Book that doesn’t have the answers for today’s postmodern generation; that we need to get back to “Vintage Christianity” and “Ancient-Future Faith”. What they are referring to are practices and beliefs as found in the Catholic Church! or “Emergent Church” to find links to almost every article I’ve written. What these Emergent Church leaders seem to be promoting are the same kinds of things we see in the Roman Catholic Church. In fact it is the belief of many, such as Roger Oakland (and myself) that the entire Emergent Church Movement is really a secret, covert effort of the Roman Catholic Church to draw Protestants, Evangelicals, Fundamentalists and Independent Churches (what the RCC calls their “separated brethren”) back into the Roman Catholic Church which itself is the Institution prophesied as the Mother of Harlots, and BABYLON and MYSTERY. The primary means for the RCC to perform this monumental task is the Order of the Jesuits founded by Ignatius of Loyola that not only exists today, but has infiltrated many of our own Christian institutions, denominations and churches. Many Emergents are friendly with and associate freely with Jesuits. For more on this, look at KNOW YOUR ENEMY, parts 33, 34, 35, 36 and 37 on the history, motives, oaths and plans of the Jesuit Order produced by The FUEL PROJECT. Also from: The RED PILL CONSORTIUM you can read an article about this Beware Jesuit Infiltration to read the article. "PEACE, PEACE WHEN THERE IS NO PEACE..."
There is an organization here in the United States called The PEACE ALLIANCE; they are lobbying the Federal Government to become an official, Cabinet level division within our country as The DEPARTMENT of PEACE. Its leaders: Marianne Willliamson, Neale Donald Walsh, and leading member Barbara Marx Hubbard are all NEW AGERS! With Federal funding and official backing by our government, they will be able to enforce their laws upon every religious body, organization and church. Basically, no religion will be able to claim exclusive truth that will make them distinct, unique and different from any other religion. No exclusive claims will be allowed regarding any religious book as the only Divinely Inspired Revelation of Truth from God, no religion will be tolerated that states that their religious Founder was superior or supreme to any other religion’s Founder, such as the claim that Jesus is God Incarnate and uniquely the only begotten Son of God! Any such religious body that makes exclusive claims, under the DEPARTMENT of PEACE will have sanctions placed upon them, perhaps even monetary fines or the removal of the church’s tax exempt status, or worse. This Department will enforce an ECUMENISM that will promote unity among religions! Again, here we see religious and political power merging! One is the HOLY EUCHARIST in which the mystical Presence of Christ is supposedly incarnated into the bread and wine offered up during the Mass. How this can actually transpire is a ‘MYSTERY’ that the Roman Church claims cannot be understood (and is entirely unbiblical as we saw last month). Eucharistic Evangelism is being heavily promoted by the RCC and many Protestants, even Evangelicals and Fundamentalists (so-called) are beginning to endorse and even participate in the Eucharist. Healings and miracles during the Mass when the Eucharistic Host is presented and worshipped as Jesus Christ have been reported. The other Mystery that is not so well known, but is making a come back under the guise of “Vintage Christianity” and “Ancient-Future Faith” is Contemplative Prayer, also known as contemplative spirituality, centering prayer, breathe prayer and the Spiritual Formation Movement. The Catholic writers previously mentioned, and highly recommended by EMERGENT LEADERS were all practitioners of Contemplative Spirituality and Contemplative Prayer. “Vain repetitions” is from the Greek word, battologeo, meaning “to stammer, to stutter, to speak tediously, to repeat idly; it denotes meaningless and mechanically repetitious phrases. A practice of pagan, not Jewish [and certainly not true Christian] prayer. Contemplative Prayer is neither contemplative nor is it prayer; it’s a practice developed by who are known as the Catholic Desert Fathers, who borrowed from Eastern meditation techniques found in Hinduism and Buddhism and simply dressed it up in ‘Christian’ (Catholic) clothes. A word or phrase is selected like “Glory of God” or “Jesus” and this is repeated over and over again, just like a Hindu meditation mantra (“Oooommm!”) until an altered state of consciousness is achieved, and once this is so, you can expect to receive ‘messages from God’. Yet to contemplate is to “think with concentrated effort” like in meditating upon God’s Word – you are thinking intently on the meaning of the Scripture, filling – not emptying your mind; and prayer is simply communicating to God; but in contemplative prayer one does not contemplate nor does one communicate anything to God. Imagine someone calling you on the phone and all they did is repeat the word “steam” over and over again. What communication has been achieved by this? Nothing. In reality, contemplative prayer’s purpose is to alter your state of consciousness in the very same way that Eastern meditation does or various hallucinogenic drugs will do. The alarming fact of the matter is that once you bring yourself to an altered state by any of these means, you are actually opening yourself up to demonic influence and potential demonic possession and seduction. It’s been thoroughly documented in many books, such as A TIME of DEPARTING by RAY YUNGEN that any professing Christian that has engaged in contemplative prayer has had their spiritual convictions changed from a Biblical view, to a New Age/Ecumenical/Eastern Religion/Pagan-witch-Mother Earth Worship view. Such was the case with Sue Monk Kidd, a once conservative Baptist [who] found the "secret" in contemplative prayer and has now become a strong proponent of contemplative spirituality and a practitioner of New Age/Wicca (witch) beliefs and written many books on this subject. Incidentally, Eugene Peterson, creator of The MESSAGE BIBLE, has endorsed her more recent book, WHEN the HEART WAITS. Kidd now believes in panentheism, or that “all is God” – everything from the “rust on the iron gate outside of her house” to the dog doo-doo in her backyard, to the rainbow and clouds and stars in the sky, to the earth itself . . . and all humans including herself, of course. Did you know that in every major religion there is a mystical meditation practice? Of course Hindus and Buddhists and other Oriental disciplines have practiced meditation for millennia; but in Islam there are the Sufis that also practice meditation very similar to Contemplative prayer (Thomas Merton, Roman Catholic priest and contemplative advocate has had interaction with Sufi’s and admired their spirituality and claimed to be “a Sufi at heart”). Native American shamans have their vision quests, witches practice meditation and can achieve an altered state of consciousness just as with those that practice Transcendental Meditation, Kundalini Yoga or just Yoga. Every advocate and practitioner, no matter what their religion, end up adhering to the same basic belief that we are all part of God, that we are in some way God and all of creation is God. I personally believe that contemplative and meditation practices is what’s going to be the global glue that seduces, deceives and conforms the members of all religions towards a spiritual unity that will incorporate the One World Religion or the MOTHER of HARLOTS. We are certainly living in days of deception, and as it states in 1 Timothy 4:1 “in the latter times some shall depart from the faith and giving heed to seducing spirits and doctrines of demons” – and we see such seduction and doctrines from the teachings of Alice Bailey, Marriane Williamsen, Neale Donald Walsh, Thomas Merton and these others like Richard Foster and Sue Monk Kidd. I believe that this one world religious and political system will gain momentum and power as we get nearer to the coming of Jesus Christ, and that there will be unity among all the people of this world except for: biblical Christians. We will stand apart; we must stand apart for the sake of the Truth found ONLY in the HOLY BIBLE, for the sake of remaining faithful to our LORD JESUS CHRIST Who ALONE can bring salvation to lost souls. And if this DEPARTMENT of PEACE comes into being, then we here in America will in all likelihood experience persecution and perhaps even imprisonment! Yet I also believe that in such an hour as that, the LORD will shower such grace, powerful enough to stand strong and faithful and not deny His Name or His Word! May we keep our eyes open to further developments and if we feel we are not spiritually ready to endure such a time, then to get ready, because I personally believe that such a time is sooner than we think! stick with the Holy Bible - there is a reason (agaisnt all Satan's schemes) that it exists.